Holiday treats are the best treats! So, are you from one of those families that always had cherry rounds on the dessert tray during the holidays? Cherry Rounds (aka Cherry Balls) are one of my all-time favourite holiday recipes. If you have no idea what I’m talking about, then check out this recipe from Bacon is Magic that is almost identical to the one I grew up having my mom make. I have it written on an old school recipe card that is well worn. We always made too many, then froze them and I’d spend the next month sneaking them out of the chest freezer in the basement…they were even better cold. Fast forward to Easter and I have been trying to think of a fun, tasty treat for the dessert tray. For some reason, the cherry rounds kept coming to mind so here is my take on updating to better reflect the Easter holiday (the commercialized version). If you like creme eggs and chocolate you should give these a try. These are also a fun way to get the kids involved in the kitchen. I remember helping my mom make these every year and now I’m enjoying having my own kitchen helper. I’ll blame Kailyn for the not so perfectly rounded balls. Sshhh don’t tell. rolling these in dutch cocoa powder rather than graham crackers. How does that sound? Chocolatey enough for you? I’m already thinking ahead to next Christmas – why not swap out the creme egg for a chocolate covered cherry? Looking for more Easter treats? Check out: 11 fun ways to use up your leftover Easter candy. In a bowl, add coconut, icing sugar, butter and 1 Tbsp of cocoa powder. Mix well. Place mixture in fridge for 10-15 minutes. Unwrap creme eggs and set aside. 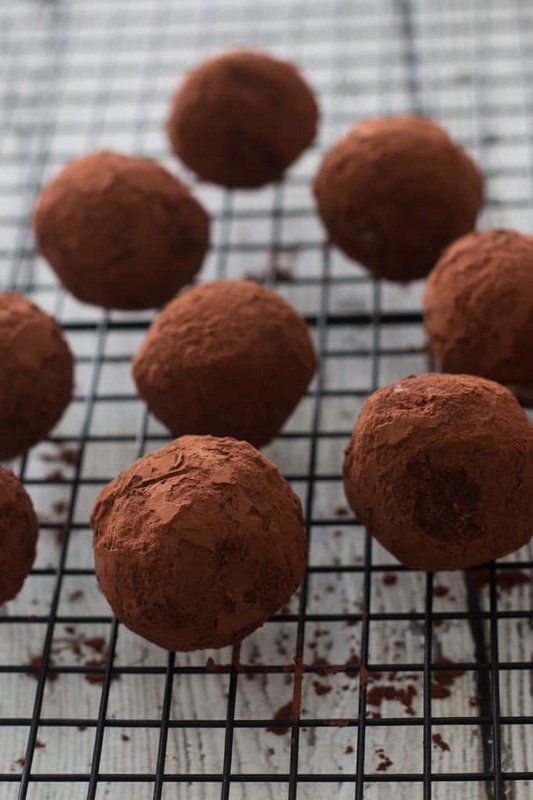 Add remaining cocoa powder to a plate or flat dish. Remove mixture from fridge. Take one heaping tablespoon and flatten in the palm of your hand. 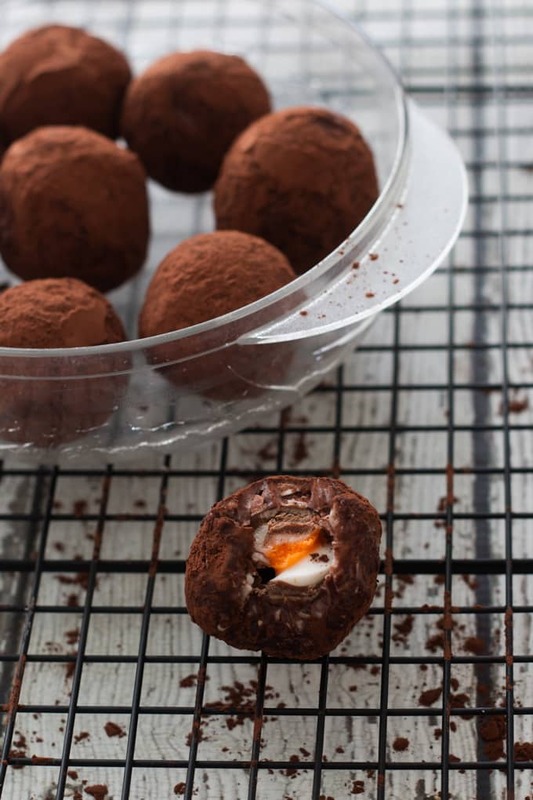 Place one creme egg in center and fold mixture around it into a ball. 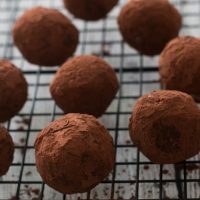 Roll the ball in cocoa powder and set aside. Repeat. 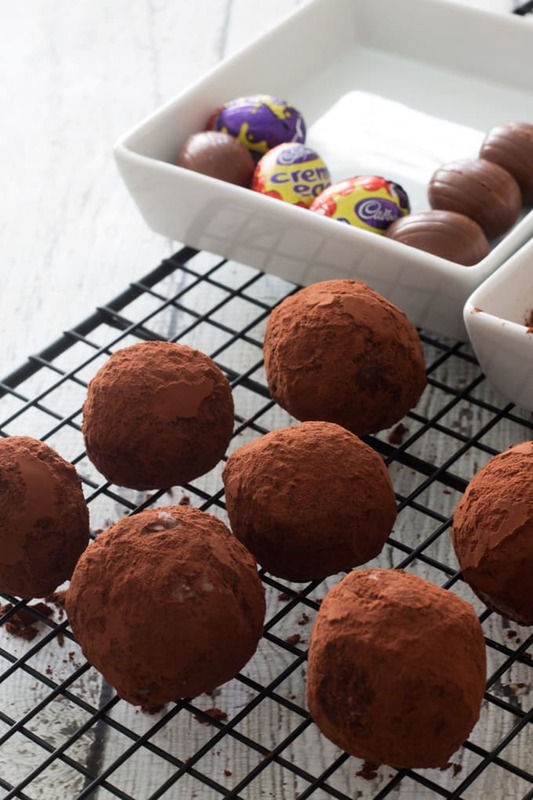 I love cherry balls at Christmas but these look amazing for easter! Thanks Ayngelina. Cherry balls really are a classic and I was so excited when I found your recipe online.